Over the many years I’ve spent as a recruiter, I’ve always maintained that recruiting is actually a consultative sales position. In fact, it’s one of the purest forms of sales that you can imagine. It involves selling a complete intangible – something that you can’t touch or feel, but rather a concept. In the case of 3rd-party (agency) recruiting, each deal is actually a series of multiple intangible sales events. First the recruiter has to sell the concept of using the agency’s search services to a potential client company (an employer with open jobs.) Once they get a signed Fee Agreement with that client company, then the recruiter has to actually go out and find — and then sell that company’s job opportunity to — a person who fits the employer’s specific requirements (a qualified candidate.) If the recruiter is successful in “selling” both of those intangibles, the next goal is to get the two parties in a room together (the interview) and hope they like each other. Essentially, it’s then up to the candidate to “sell themselves” to the hiring authority during that interview. At the same time, that hiring authority must “sell their company” to the candidate so that an offer will be accepted. If that results in the candidate getting hired (a placement), and then the client company actually pays their agreed-upon fee to the agency – then and only then does the recruiter get paid! When you consider how many things can go wrong with such a complicated series of intangible sales events, it’s easy to see how difficult a recruiter’s job can be! For job-seekers, the principle is essentially the same. It’s often said that looking for a job is itself a full-time job. The process of searching and interviewing for a job is actually a pure consultative sales position. You are “selling” an intangible … yourself! You are selling your experience, your skills, your personality, your talent, and your potential to solve a potential employer’s problems. The analogy to job-seeking in today’s market should be obvious. You’re not selling a refrigerator or a car, where the “features and benefits” speak for themselves. (No one gets hired from simply sending a generic résumé.) You are selling a complex intangible – yourself – to someone who has a problem he wants solved! The process should involve a dialogue designed to uncover the needs of the employer you are targeting, and designing a “solution” that will meet those needs. In other words, you should be trying to understand the company’s culture, the specific goals of the job you are looking at, the needs of the hiring authority, and addressing those needs and solving their problems. This involves doing company research, networking with people who may have inside information about the hiring authority and the company, and studying (and mirroring) the language of the job description. Tailoring your “sales presentation” (your résumé, your cover letter, your phone messages, your emails and ultimately your interview presentation) to specifically address and meet the needs of your “customer” (the employer) and solve their problems will put you miles ahead of your competition for that illusive “sale” – the job! Entry filed under: Advice for Job Seekers. 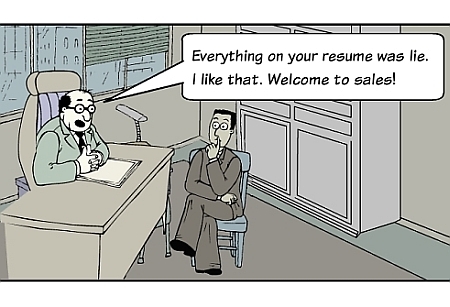 Tags: consultative sales, job-seekers, networking, unemployment. The articles on you Blog are so well-written! How did you accumulate so much experience in your field to be able to present such powerful ideas, suggestions, and advice to Job Seekers? A very comprehensive and holistic approach to the concept of job search. Well done. It’s very interesting reading your article, as it is very difficult to explain how different and complex it is from other sales roles. I always think it is really an Art, and involves a lot of communications. Enjoyed your article very much especially the consultative selling approach. I have been in corporate household goods transportation sales for 31 years. Since my career began in 1977, I have discovered that there has been a more sophisticated evolution in the purchasing of services. The human resource buyer is looking for solutions, not slick sales pitches. Thank you Michael. Excellent article. Very informative and dead on! You hit the job search head on as a consultative sales position. Well done! Various people talk about this issue but you wrote down really true words! I am so happy to have found this. It is a great forum. Your posts are very informative, flowing and easy to follow, inclusive of many important details, helpful, and refreshing. OK. Been an Electrical Engineering Manager for many years. Now, at 69, I am teaching English in China. Plenty of work out here. I am valued. Living is cheap.